Directed and executive produced by Emmy winner Ben Stiller, ESCAPE AT DANNEMORA debuts on Sunday, November 18 at 10 p.m., and stars Academy Award winners Benicio del Toro and Patricia Arquette and Golden Globe nominee Paul Dano. The series is based on the stranger-than-fiction prison break in upstate New York in the summer of 2015 which spawned a statewide manhunt for two convicted murderers, aided in their escape by a married female prison employee who carried on months-long affairs with both men. Del Toro plays convicted murderer Richard Matt, an artistic yet intimidating force within the prison, who masterminds the escape. Arquette plays Tilly Mitchell, a working class wife and mother who supervises the prison tailor shop and becomes sexually involved with both men, ultimately agreeing to hide hacksaw blades in frozen hamburger meat to help them get out. Dano plays David Sweat, a convicted cop-killer who may have genuine feelings for Tilly and becomes a reluctant partner in Richard Matt’s plot. The cast also features Golden Globe and Emmy nominee Bonnie Hunt, acclaimed actor Eric Lange and Emmy nominee David Morse. ESCAPE AT DANNEMORA is written and executive produced by Brett Johnson (Mad Men) and Oscar nominee Michael Tolkin (The Player), who met while working as writers on RAY DONOVAN. In addition to Stiller, Johnson and Tolkin, Bryan Zuriff (Steve Jobs, RAY DONOVAN), three-time Academy Award nominee Michael De Luca (The Social Network, Fifty Shades of Grey) via Michael De Luca Productions, and Nicky Weinstock for Red Hour Productions serve as executive producers. SHOWTIME has given a production order to ESCAPE AT DANNEMORA, a new eight-hour limited series starring Academy Award(R) winners Benicio del Toro (Traffic) and Patricia Arquette (Boyhood), and Golden Globe nominee Paul Dano (Love & Mercy, There Will Be Blood). Emmy(R) winner Ben Stiller will executive produce and direct all eight episodes. The limited series is based on the stranger-than-fiction account of a prison break in upstate New York in the summer of 2015, which spawned a massive manhunt for two convicted murderers who were aided in their escape by a married female prison employee with whom they both became sexually entangled. Production will begin later this year at the actual locations in upstate New York. 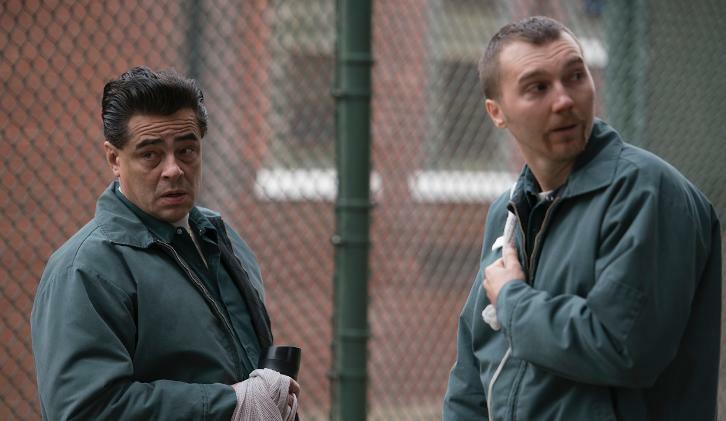 ESCAPE AT DANNEMORA is the network's next high-profile limited series, on the heels of the launch of the new TWIN PEAKS, which generated a record number of streaming service signups for SHOWTIME. The announcement was made today by David Nevins, President and CEO, Showtime Networks Inc. Del Toro will play convicted murderer Richard Matt, an artistic yet intimidating force within the prison, who masterminds the escape. Arquette will play Tilly Mitchell, a working class, married woman who supervises the prison tailor shop and becomes sexually involved with both convicts, inducing her to assist them with their escape. Dano will play David Sweat, a convicted cop-killer who uses his good looks to seduce Tilly and becomes a reluctant partner in Richard Matt's plot.